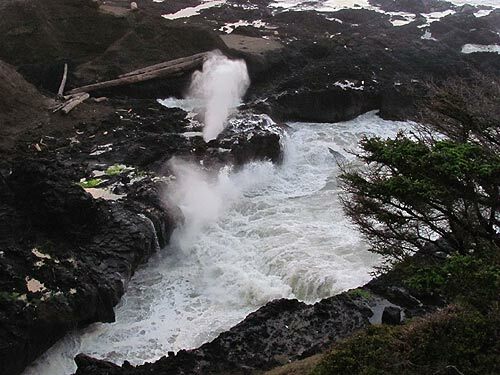 (Yachats, Oregon) – One of the wilder features of the entire Oregon coast, the spouting horn at Cook's Chasm is certainly among the most animated as well. It fires off water into the air, sometimes quite high, making a surprising hissing noise. At times, it makes you think of the black smoke monster from the TV show LOST, but this version is all white. Even more surprising: the time of day can change that color drastically. A new video from Oregon Coast Beach Connection shows all that. Taken at various points over the years, the video displays two sides of this watery bit of pyrotechnics. One side is slightly stormy conditions; the other late in the day when the sun hits it just right and lights it up into a fiery red. 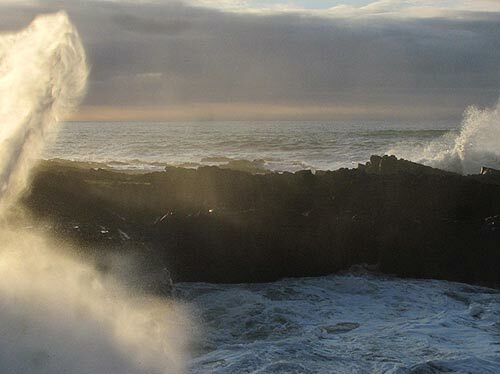 The spouting horn at Cook's Chasm is right at the Lane County and Lincoln County line, a few miles south of Yachats. 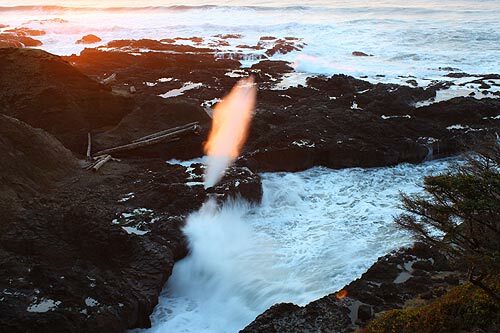 Such water-gushing geysers along the Oregon coast are created by constant wave erosion over thousands and thousands of years, if not millions. The basalt rock that typifies this area gets slowly worn down, and its weakest points go first, creating larger and larger gaps over time. Eventually, a part of the basalt next to a gap grows yet another mini-gap, or maybe just a hole. If the tide is able to duck under that area, all that ocean creates a lot of pressure and gets released if there's any opening. If the hole or gap is at just the right dimension, shape and angle, you get a spout of spraying ocean shooting upwards. The entire Yachats area is mostly comprised of basalt that is some 50 million years old. So that on its own is a bit impressive when viewing the Cook's Chasm spouting horn. All that rock around you was once part of a volcano's lava flow – most likely Cape Perpetua itself, which towers over the Chasm. Many of these volcanoes in this area were actually underwater as well. 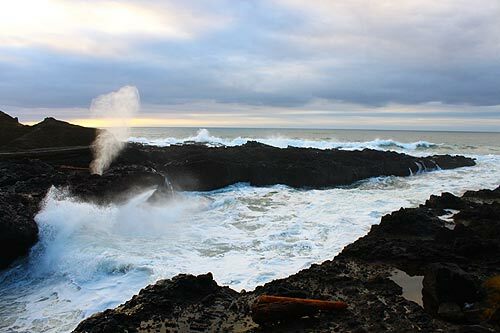 More on Yachats / Cape Perpetua geology. More on this part of the central Oregon coast at the Upper Lane County Virtual Tour, Map.